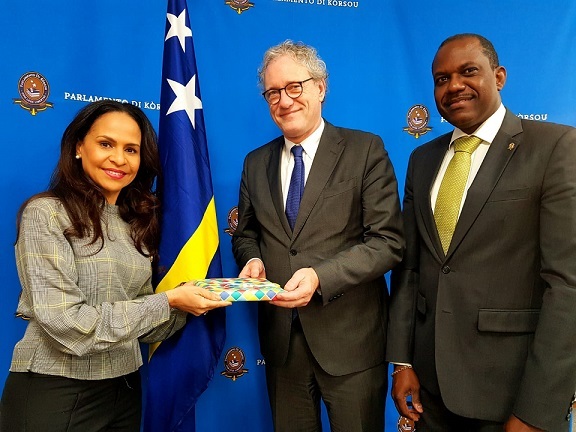 WILLEMSTAD - On Friday, the Vice President of Parliament, Mrs. Giselle McWilliam and a delegation of faction leaders received Mr. Thom de Graaf, new Vice President of the Council of State of the Dutch Kingdom. This courtesy visit is in connection with De Graaf’s appointment as Vice President of the highest advisory council of the Kingdom. De Graaf is well-known in the islands. He used to be a minister in the Dutch government in charge of Kingdom relations. He was also Member of Parliament in the Second Chamber in The Hague. Now he will deal with the islands in his new role. It is also good to note that the King of the Netherlands is the President of the Council of State.